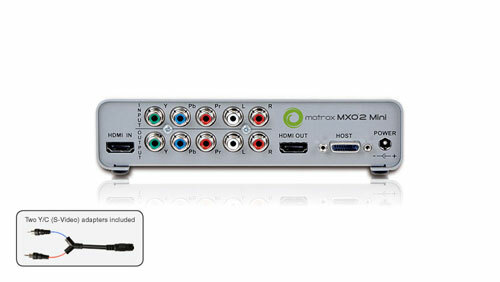 When Matrox first brought us the MXO2, I was so impressed I ended up with one in my edit suite. The MXO2 was a great addition to my Final Cut Suite, giving me features of more larger, and expensive breakout boxes. Fast forward and Matrox follows up the MXO2 with the MXO2 mini. Behind that I personally own an MXO2 I was not surprised at all to find this small this small device is absolutely fantastic. It’s ability to turn almost any HDMI screen into a professional monitor using Matrox’s Color Calibration tool is highly effective. Providing you with up to 10bit 4:2:2 color. As with its big brother this gives you control ver Hue, Chroma, Contrast, brightness and blue only. It also provides you with the ability to monitor at a 1:1 pixel ratio. This basically means there is no distorting of the image to fit the screen. Being so small the MXO2 mini can be taken anywhere and is supported by either PC or MAC, Avid or Final Cur Pro or even Adobe CS5. This means you can a full edit suite almost anywhere you go. Although trying to carry multiple screens around amy prove a little more difficult. Matrox has really hit this one out of the park, especially at its features and its incredible low price point of $450. This is a definite purchase for any editor loking to make their workflows more efficient. The only thing I truly miss on it is the inclusion of HDSI, but that would most definitely drive the price up. Plus If you need XLR’s and HDSDI then it’s bigger brother the MXO2 is right up your ally.